This page describes Emmett shirts, including the different fits available, and gives detailed garment measurements which are no longer available on the Emmett website. You can purchase Emmett shirts by clicking on the image below. Emmett has two different fits of formal or dress shirts. The Classic Fit shirts are Emmett’s widest cut around the chest and waist. The Slim Fit cut is narrower around the chest and waist. Shirts that fit like Emmett shirts? Shirts that fit like Emmett Classic Fit include the Eton Shirts classic fit. Shirts that fit like Emmett Slim Fit include the Ledbury Slim Fit. 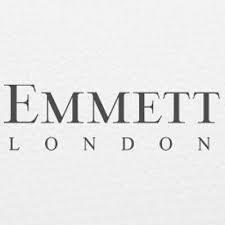 Emmett offer a made to measure service for shirts. I tried Emmett made to measure many years ago and was happy with the service they provided. I would still be wearing the shirt but I lost weight and it no longer fits me.